Go swimming and have great vision underwater with Corrective Lens Swimming Goggles from The Scuba Doctor. If you wear prescription glasses to see clearly, swim goggles with your exact prescription can be obtained. But it's very expensive and time consuming. Most swimmers don't require this expensive solution and their needs can be solved with less expensive and quick to obtain corrective lens goggle solutions. The important thing here is to make sure that the variety of your needs are taken into consideration and the right solution is chosen. We also have Prescription Lens Masks for diving and snorkelling. If you don't understand the difference between swimming goggles and diving masks, please see Goggles vs Masks. Correction/optical goggles come with ready-made spherical lenses of varying strengths known as dioptres, or step dioptres. This type of lens production is similar to the generic reading glasses found in pharmacies: the prescription will be a close match to your own, but may not be as precise as that in the prescription glasses or contact lenses you use every day. For use in the water (an already-blurry environment), step dioptre corrective lens goggles are perfectly adequate. They are also more widely available and affordable than custom-made prescription goggles from an optometrist. As a swimmer you probably just need to see objects in the distance, therefore a distance only correction lens can be used with selected goggles. The solution is what we call Negative Dioptre Lenses for short/near-sighted people with myopia. It's a negative correction to the whole lens. Lenses range in dioptres from -2.0 to -10.0 and typically come in increments of 0.5. For some swimmers it's the reverse and and they need Positive Diopre Lenses for near vision issues. The solution is what we call positive corrective lens goggles — a positive correction to the whole lens — for long/far-sighted people with hypermetropia. Lenses range in dioptres from +1.0 to +6.0 and again typically come in increments of 0.5. Once you know the dioptre values you need, you can then select goggles for which the range or dioptre values available matches your requirements. None of the 'off the shelf' corrective lens goggles correct astigmatism, so if the majority of your prescription is astigmatism, or you have astigmatism over 2.00 dioptres, you will need a custom made product for best visual results. If your astigmatism is less than 2.00 dioptres, or is not the majority of correction, then the corrective lens goggles solutions we can provide should be fine. This is another reason why you should consult your optometrist. We strongly recommend that you consult your optometrist about which swimming vision correction solution is best for you. We recommend you show them this information. Your optometrist will be able to work out which corrective solutions are available to you and make recommendations as to what to get, plus provide the two dioptre values we need. We are not optometrists and can't read your script to determine if a corrective lens goggle will work for you. Correction/optical lenses typically will work for the vast majority of people, but some eye shapes can't be accommodated this way. Your prescription may need to be changed, because the distance between the lens of your swimming goggles and your eyes typically is different from the distance between your eyeglasses lenses and your eyes. (This also is one of the reasons your contact lens prescription is different from your eyeglass prescription if you have moderate or high myopia.) An eye care professional specialising in sports eye wear can adjust your prescription for swimming use. Your optometrist will also be able to provide you with the best spherical correction dioptre values for your left and right eyes given the half dioptre increments of corrective lenses. Then you can order your corrective lens goggles from The Scuba Doctor with confidence in achieving a great outcome. Whatever your preference, there are plentiful corrective/optical lens options available to ensure that everyone can see clearly to experience the beauty and wonder of the underwater world while swimming. If you buy your swim goggles complete with two corrective lenses from The Scuba Doctor, we will fit the optical lenses to the goggles for you before sending the swimming goggles out. Prescription swimming goggles may be a bit more expensive than non-prescription goggles, but they are still very affordable (and getting more so every year). 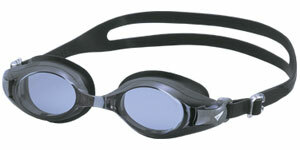 If you are having trouble deciding which optical swim goggles to buy, consider asking your optometrist. Once you have your goggles, it may take a few minutes for your eyes to adjust to new lens, but after a short adjustment period, you should be able to use them adequately in the pool. Contact Lens Wearers: Not all contact lenses are suitable for swimming. Gas permeable lenses (GP lenses) can 'dig' into the eyes below certain depths, because of the pressure. Soft contact lenses can collect waterborne organisms and become contaminated, causing eye infections. If you wear contact lenses under your goggles for swimming, you need to make sure you blink a lot. Excessive starring can cause bubbles to form underneath your lenses and which may cause minor discomfort and temporary blurring of vision. Also be sure to have a spare set of contacts (or glasses) available in case you lose a contact underwater. As best as we can tell, you will be unable to claim for a refund from your health fund for the supply of a corrective lens goggles. Most health funds require a medical provider item code for a claim to be successful and no dive manufacturer or dive shop we know of has this. However, you may wish to check with your health fund to see if they are more generous.